Public workers and their allies – teachers, nurses, firefighters, university workers, students and citizens – haven taken over Wisconsin’s state capitol Madison since the Tuesday, at times with an crowd up to 70,000 people. (Here’s a quick video that gives a sense of the protests, and see a variety of other compelling videos here). But contrary to media depictions, what’s going on in Wisconsin is not a battle over the budget. As Madison’s Capitol Times reported on February 16, the state was projected to have a $121 million surplus, and now faces a deficit only because of special interest giveaways by the new Republican governor. State employees have already given back to help balance the budget. Conservative media have been making up erroneous statistics about public employee salaries in Wisconsin. The Economic Policy Institute shows that public workers there make about 4.8% less than private sector workers, though their benefits are slightly better. 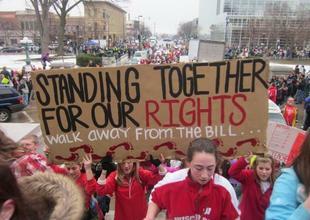 Wisconsin was the first state in the nation to guarantee collective bargaining for public employees, in 1959. It’s a fundamental right and this is a fight that concerns all of us here at UC. The current right-wing campaign shows that this is not a right we can take for granted but must be ready to defend. What can you do? Demonstrations and rallies will be taking place this week all across the United States, including Tuesday at 5:30pm in Sacramento at the State Capitol and in Oakland (rally at the State Bldg, Clay & 15th). The Wisconsin State AFL-CIO webpage has reports on the latest developments and a page for taking action, including donating money and contacting representatives. Wisconsin’s Southern Central Federation of Labor has just voted to prepare for a general strike. Budgetary pretexts are something UC employees are used to. Retired UC professor Charles Schwartz has recently released two reports examining a $4 billion discrepancy over 12 years between what UC budgeted and what its actual expenditures were. UC budgeted $400 million to $500 million more per year than it actually spent, and Prof. Schwartz raises the obvious question: where did that money go? UC-AFT president Bob Samuels has prepared a "short budget primer [that] tells us certain important facts," among them: "1) no one knows where the money is going or how it is being spent." States Samuels: "Everything in the [UC] budget is determined by priorities, and it our role to change these priorities." Meanwhile, seven UC campuses failed an audit to test the university's responsiveness to public record inquiries, earning an overall "F" from the government watchdog group Californians Aware. The California State system received an overall "B" grade, prompting the San Jose Mercury News to suggest "peer tutoring" by Cal State and "remedial work on open government" for UC. Retire health care for public workers is increasingly endangered. In California, the Legislative Analyst's Office "urged action . . . to reduce pensions for future employees throughout the public sector," which may be part of an "exchange for placing tax hike extensions on the ballot as part of Gov. Jerry Brown's budget plan." According to the Bureau of Labor Statistics, state and local employees pay 11 percent of the cost of individual medical plans on average, compared with 20 percent for private-sector employees, and state and local employees pay 27 percent of the cost of family plans, compared with 30 percent for private-sector employees. State budget cuts and the poor economy are having a devastating impact on students at Cal State Northridge, who are being "Squeezed from All Sides." According to this report from the UCLA Civil Rights Project/Proyecto Derechos Civiles, "this threatens the future of a state that needs a one million increase in college graduates." March 2nd will be another Day of Action for Public Education across California to protest higher fees, more layoffs and budget cuts, fewer resources, reduced benefits, and fewer decent jobs.